Well, no need for the Colonization of the MLB like we planned, Tim Lincecum has decided to do it himself. 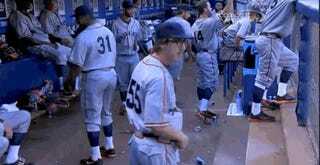 What If All Baseball Players Were Fat? The Giants are wearing flannel unis today, like in the old days, and Lincecum added an extra boiler to his as on his off day. 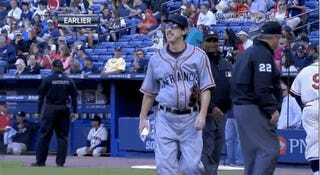 Lincecum went out to hand in the lineup cards before the game and then trotted back to the dugout with his newfound pot belly. And here he is demonstrating a classic Fat Guy hand-in-the-pants move as he heads out. Check out the full video over at MLB.